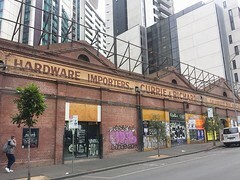 More facadism in Bourke Street – you can help. The Walk Arcade in the Bourke Street mall was built in 1980 through the ground floors of 6 heritage buildings, leaving everything above abandoned. Various proposals have been mooted in the last few years, but this is the first one that is now up for planning, and the plans are very sobering. It looks superficially ok, but actually it involves keeping only the facades and short side walls of 4 of the buildings and completely demolishing the others, in order to create a large hotel. Why not keep, you know, entire buildings ? Or at least the original laneway walls along The Causeway, with all their old windows and light wells ? And what about keeping Union Lane as a graffiti hub, instead of putting mirrors on your wall to reflect the graffiti on someone else’s ? And isnt a 1950s glass curtain wall heritage too ? We also think they could do better with the ‘infill’ buildings, they shouldn’t really mimic the buildings they’re next to, how about just sympathetic modern ? or contemporary versions of what was there before ? This one is going to be decided by the Ministry of Planning because of its floor area, but the City of Melbourne will also be deciding soon, so its time to let them know what you think ! Don’t forget to sign off with your name and contact details. The site – the 1956 glass curtain wall woudl be demolished and the others reduced to facades. The 1920s building on the left would be facaded, the one on the right is not part of the site and is already a hotel. 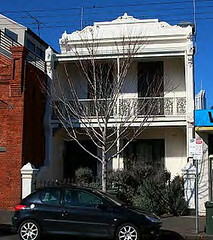 the ‘infill’ facades are stylised versions of the historic facades.